I have had such a good time for the past couple of months talking to creative stitchers I respect intensely, but only know from a distance. I have had the distinct pleasure to speak on the phone with Lauren Taylor and Sherri Lynn Wood. These were both engaging and lively conversations. Personally cannot wait to meet Lauren in the flesh, she is a hoot on the phone… One of the highlights of attending the Fall Quilt Market this year was getting to spend a little time, one on one with Heather Jones. Oh my, what a warm, true, and delightful human being she is! The first time I had the opportunity to talk with Amy Butler (at last Spring’s Quilt Market) I was blown away by her honest connection. For someone who comes in contact with as many people as she must, she gives her full attention to each interaction. I was touched, and gratified to know that you can get to a place of prominence and success in your field while staying human. Hooray! She was just as charming this Fall, and now we have plans to spend some quality time here in Maine (more below). Carolyn Friedlander also shows at Quilt Market and so I got to spend a little time with her as well. A woman who quilts AND sews garments, after my own heart. And crikey, her booth! The reason for these conversations has been to organize opportunities for these lovely people to come to Maine to share their knowledge with us. Don’t get me wrong, I am not a stalker, nor do I tend to gush over luminaries (at least not to their faces). I believe that at their hearts, people are people, whether their judged success is great or not. Yet it is such a reward to find that the people who’s work you have admired from a distance are real humans, that they put their pants on one leg at a time, and they want to talk with you about making the same way you want to talk with everyone about making. On the whole I have had such gratifying interactions with most everyone I have spoken with in the greater sewing world. What a fabulous community…. My intentions for AGOS were always to reach out to the wider making universe to bring talented stitchers here to Maine. Over the years I have attended various retreats, and I think the format is great. I have moved the timeline up from my initial plans. It is Always good to be flexible. So connecting with these renowned makers has been a little silver lining for my fledgling business. I love (LOVE) planning cool events. My idea of planning may be a hair different from other's ideas. I like to corral all the necessary elements- the housing, the food, the tools and the participants- and then let them do their thing. I feel that when you put a group of creative people together with the facilities they need, cool things will inevitably happen. I have tried to do that with our space here at 54 Cove Street. When the studios are buzzing with activity I literally smile out loud. It makes my heart sing. Especially the relationships that have formed between previously unknown crafters. They share ideas, issues, solutions, support. They have made a community, independent of me. I set up the space, found the tools and then set them loose in it, and I could not be prouder of what this place has become. So I want to do the same thing on a smaller scale, for shorter periods of time as respites from our daily lives. This is what brings me to the idea of retreats, and our new offerings. After a couple months of conversations, looking over the calendar and thinking about what is special for visitors to Maine, I have come up with four retreats for 2015 with a handful of first-class instructors. To pause on this trajectory, I must mention that all of these events do take the unique experience of Maine into account. I live here, sometimes (like today when we are experiencing freezing rain) I take the place for granted. I forget the beauty, the rough, expansive, close-to-nature experience that is Maine, I forget that it is special up here. But those of you who don’t live here, you don’t. You have these romantic images of this state that are often correct, but usually underestimate the depth of the landscape. Maine is big, and most of it is rural- full of trees and wildlife. But here along the coast we approximate the same small city life that takes place in many other parts of the world. Portland itself has a thriving and nationally recognized food scene. Bon Appetit called it the Foodiest Small City in 2009. We have two James Beard award-winning chefs cooking here. People travel to Portland just to eat here. Truly. While we are a small city (65,000 proper, 250,000 in the surrounding suburbs) we are very close to the nature that Maine is most known for. Drive thirty minutes and you are well and truly in the country. You will see deer, turkeys, perhaps a Fisher Cat, most certainly farms and well-tended kitchen gardens. Maine is a model for all those Brooklyn hipsters. Having grown up in Brooklyn Heights, Portland reminds me of my roots. Here in Maine, we live closer to the land, even when we are in our cities. We are makers- be it cheese or beer, gardens or quilts or clothing. It is only logical to organize the structures to give others the chance to live what we live, if only for a long weekend. Please, come to Maine and stitch. I am thrilled and honored to be able to offer the following workshop/retreats for your stitching learning and enjoyment. The first in my series for 2015 will focus on two days of learning to sew curves for quilts with the inimitable Sherri Lynn Wood. Get Your Curve On will be the first two days of Sherri’s spring East coast tour starting the last day of April. A small group of ten participants will have the chance to spread out in our 4500 square feet of well-equipped studio to explore the process of sewing curves, on purpose. We’ve got large cutting tables, mats, rotary tools, design walls, and all the other tools you could need. If you don’t want to bring your sewing machine, we have them on site. You will be fed a delicious Maine lunch brought to us by Bread and Butter Catering Company both days, to allow you to unplug from the outside world and really focus. For quilters looking to expand their toolbox, this will be a unique situation. In such a small group you will have a real chance to ask detailed questions, get expansive answers and then put that knowledge into practice. You can read all about this workshop Here. In July the dynamic duo of Amy Butler and Heather Jones will journey to our bucolic state to lead another small group through their paces to discover their color stories. This time we will head further North along the coast to the Point Lookout Resort in Northport, situated between Belfast and Camden. Point Lookout ticks all the boxes for the classic Maine experience. Tucked into the side of the coast, overlooking the Atlantic ocean, carpeted with pines, the resort is 387 acres of Maine at its best. It has it’s own farm, miles of trails, fully equipped cabins and delicious food. We’ll spend a long weekend relaxing into color with the charming ladies. All your needs will be taken care of, luxuriously, and this small group can dive deeply into their relationship with color. Amy will start the retreat with her unique approach to fabric, tone, hue, and saturation for the first day. 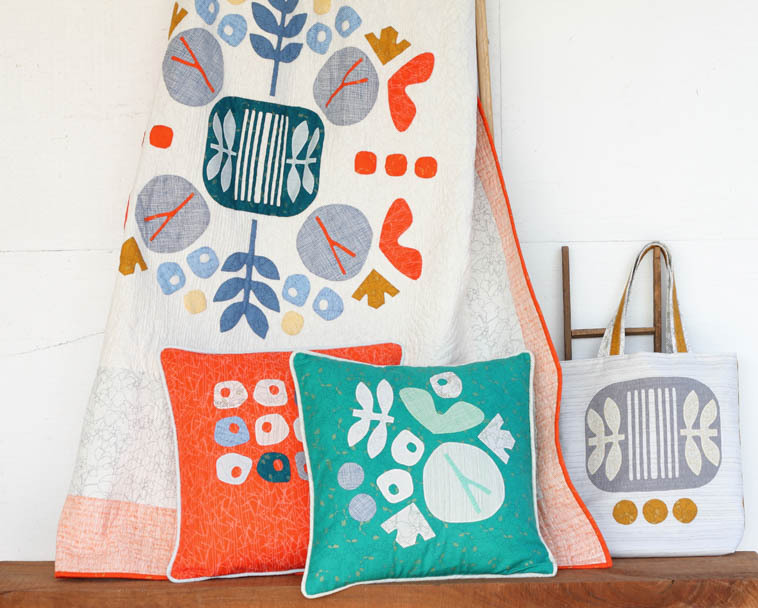 On the second day Heather will offer ways to translate it all to pattern and design. We will take at least one field trip for a farm dinner, created just for us, at Salt Water Farm in Lincolnville. Plans are being made for another side trip. These two ladies are so wonderful to hang with, this will be a really special chance to relax and learn from them. All the details can be found HERE. The idea for the third retreat came to me out of the blue, all of a sudden, one day, and I knew just how it should come together. I consider myself very lucky that I was able to pull all these pieces in place with such ease. The Slow Stitching Retreat will take place in early August at a lovely camp in Washington, ME with the dynamic trio of Chawne Kimber, Rebecca Ringquist and Carolyn Friedlander. From Wednesday to Sunday we will unwind, unplug, relax and stitch in the woods of Maine. Medomak Retreat Center is a former girls camp that has been updated for the modern grown-up. Sleeping in modern rustic cabins, eating as a group in the dining hall (just like Summer Camp), spending mornings learning with these three talented ladies and afternoons putting your new skills into practice. This retreat will be full of fireflies, s’mores, rocking chairs on the porch, local food, bare feet, and all the stitching you could want. Summer Camp for grown-ups, in Maine, in August. No responsibilities other than making sure your needle is threaded. If you want to sew for the entire time, you will have the space and tools. If you want to go swimming in the lake, tromp around in the woods, or drive to the coast, these are all available to you. Maine in August is pretty bloody perfect. Add Chawne, Carolyn and Rebecca and I think it might be heaven. Details are all HERE. If you read any of my writing with some regularity, you know that I make my wardrobe. So when I finally got the chance to yap away an hour with the fabulous (!) Lauren Taylor, of LLADYBIRD fame, I could barely contain myself to talking retreat details. If you don’t know this woman’s work, you must go to her blog right now. I’ll wait…. Ok, back? Amazeballs (as she would say) right? Well, can you imagine spending four days sewing with her as your Fairy Godmother? Pretty damn exciting, no? For the last weekend of September (just in time to make a Fall outfit) Lauren will set up shop here at 54 Cove Street and help you with any making you choose to bring with you. You’ll have an opportunity to confer with her before the retreat starts to make the best use of your time here. Again, you’ll have access to all our tools and our three 4’x8’ cutting tables. We’ll start the gathering with a pizza party in the studio. Each day you’ll have a catered lunch (from our friends at Bread And Butter Catering) and on the last night we’ll head out to Cape Elizabeth for a Maine Farm dinner at The Well. This will be a long weekend of making, chatting, laughing, eating, sewing, chatting, laughing, rinse, repeat…… All the fine print is HERE. That was a little long winded. I apologise for such a lengthy post. But I am so excited about this phase of the AGOS experience I can barely contain myself. I have been reading sewing blogs, scanning Instagram and Flickr and generally drooling over all the cool stitching that goes on in this modern sewing universe for years now. The idea that I can bring some of it to Maine, give it a platform, make some connections, stir the pot (asitwere) and further the stitching movement makes me giddy. I am looking forward to meeting all you future participants, sharing thread and needle with you. Making new friends, cementing the community, sharing the stitch love. Won’t you join me?